When Mina Miller founded Music of Remembrance (MOR) 18 years ago, she probably didn't imagine that her tiny organization would one day commission and stage a full-length opera. That day came this week, with the triumphant world premiere of Out of Darkness, the result of a decade-long collaboration between Miller and the team of composer Jake Heggie and librettist Gene Scheer. The two acts of Out of Darkness are based on the true stories of two Holocaust survivors: the Polish dissident Krystyna Zywulska (1914-1993) and the Gay German Jew Gad Beck (1923-2012), whose lover Manfred Lewin perished at Auschwitz. Zywulska hid her Jewish identity and was incarcerated as a political prisoner, also at Auschwitz. She lifted the spirits of her fellow prisoners by writing poems and song lyrics, which were passed around the camp and became anthems of resistance. The opera portrays Zywulska and Beck in later life, with flashbacks to the Holocaust. Both have survived but are haunted by their younger selves, their losses, and the compromises they have made. Because the opera is based on three song cycles written by Heggie and Scheer on commission from MOR, I doubted that the result would be a satisfying drama. Was I ever wrong! From the first note to the last, this opera grips the audience by the throat and the heart. The central conflict for both Zywulska and Beck is the internal struggle between the desire to forget and the need to remember. In Act 1, an aging Zywulska can't sleep because she has been asked to record her memories. More than anything, she wants to forget, but three characters in the barracks of Auschwitz force her to remember: her late friends Zosha and Manfred, and her own self from that terrible time. The three repeatedly exhort her, Shoulder to shoulder,/ Do not forget us/ when you get older. 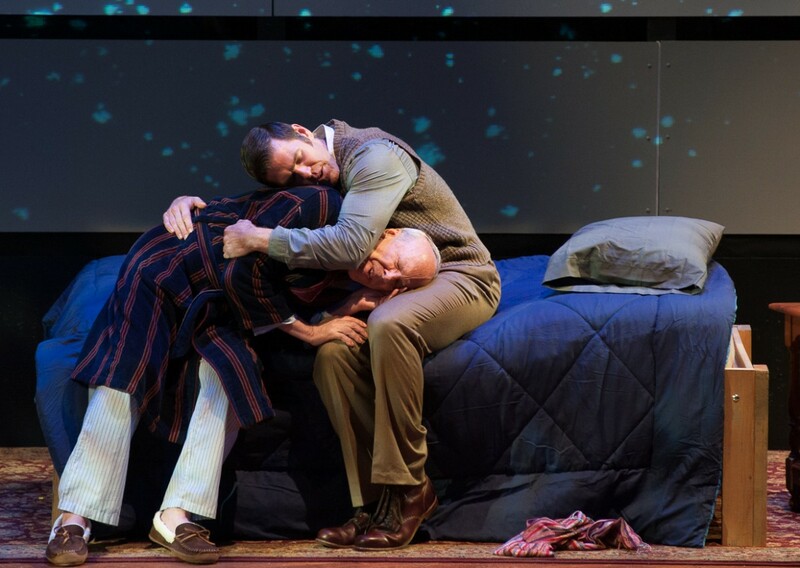 In Act 2, an elderly Beck is startled awake by the ghost of Manfred, still 19 years old (as he was when Beck knew him), and still idealistic and libidinous. Embittered by his experiences, Beck tries to reject Manfred but finally joins him in remembering happier times. Heggie's beautiful score forces the audience to share the characters' emotions. His music is both accessible and complex, at times jazzy, then classical, then Hebraic. Scheer's simple, affecting lyrics (some of which are poetic translations of the songs Zywulska wrote at Auschwitz) complement the score and heighten its emotional impact. Stage director Erich Parce and conductor Joseph Mechavich had only five days to pull together the premiere performance, and they obviously both worked well under pressure. It didn't hurt that the cast and orchestra were top-notch. Sopranos Ava Pines and Caitlin Lynch as the younger and older Zywulska, and baritone Michael Mayes as Manfred, all sang and acted magnificently. Baritone Robert Orth, cast in the speaking role of Beck, also got to show off his terrific acting skills. As Zosha, mezzo-soprano Catherine Cook blended well with the other voices in the ensemble numbers but was less effective as an actor and soloist. The chamber orchestra (five members of the Seattle Symphony and pianist Jessica Choe) simply couldn't have sounded better. Special praise is due clarinetist Laura DeLuca, whose long, spirited jazz solo provided the perfect atmosphere for the scene celebrating Gay nightlife in pre-WWII Berlin. Mayes' wordless vocalise in Act 2 became a gorgeous duet with cellist Walter Gray. The whole of the opera was so moving that it's difficult to find highlights to describe. For me, the most affecting section was the waltz sequence in Act 1 - first a delicate Chopin waltz, with ironic lyrics by Zywulska (Krystyna, why are you crying?) and an exquisite vocalise sung by Pines; and then a Johann Strauss waltz wafting into the barracks from an S.S. gathering elsewhere, while Krystyna comforted the dying Zosha. At the end of Act 2, Gad Beck danced with the ghost of Manfred, in a lovely reconciliation between past and present. A thundering ovation was interrupted by Orth singing a cappella the words of 'Farewell, Auschwitz,' Zywulska's song of defiance, written in Auschwitz and sung secretly by the prisoners there: Stand with me,/ Hold your shaved head high./ The song of freedom upon our lips/ Will never, never die. The other singers and musicians joined in to provide a rousing finish to an extraordinary work. I will never forget this haunting opera of remembrance. Click here to view the original publication.